Are you ready to go from frustrations to connections? Ready to shift from anger to understanding? Wish you had special decoder glasses to understand what in the world is going on with your children? You're in the right place if you're ready to heal the hurt and get things back on track! "I don't have the time during the day." "i want my partner to do it with me." That is exactly why i created this self-paced course. You can watch and learn on your own time. You can watch and learn on repeat with lifetime access! "I have to tell you, this course gAve me hope." i am here to help you get things back on track, FAST! have you noticed that typical, traditional, reactive parenting tools just don't work? perhaps it feels like things are getting worse. welL... they might be. But there's hope! "I thought for a long time I was a bad parent. this course showed me, I just needed new tools. Yelling wasn't working and I didn't want my girls to fear me anymore. Learning how to connect gave me my family back." perhaps you've shared this feelings with your friends and they shared "yeah, it's part of the job." the secret is learning how behavior works. I'm MegAnne, and i help build kind families. raising strong, independent, forward thinking children. I built this course to be an easy to use course teaching parents how to use highly effective positive discipline parenting tools. "This course has completely changed my way of thinking forever. Being kind and firm is hard. But understanding what your child is trying to communicate to you is an amazing skill!" 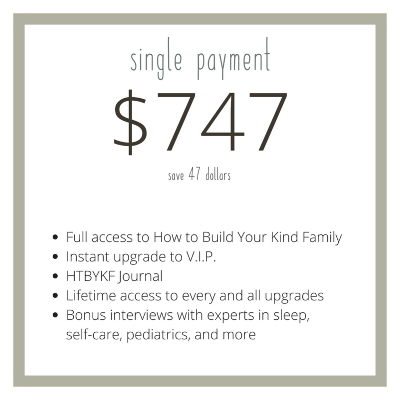 an on demand, self-paced, parenting course. combined with 7 live group coaching calls. you will learn all the foundational tools to build a kind family and receive the support to apply everything you've learned. I have spent my entire career helping parents learn more effective ways of managing their children's behavior. Which is why I started coaching, I love teaching parents what is driving their children's misbehavior and teaching them new approaches to end power struggles, epic tantrums and negative cycles- once and for all! Since 2016, I have helped over 100 families learn a more effective way of parenting, and now I am pleased to launch this self-paced course so that the entire world can learn my highly effective approach! This course combines my background in psychology, experience in child development, certification in parent coaching and Positive Discipline. All this supported with studying the latest research on social emotional learning, neuroscience and mindfulness. here's a peek at everything inside! learning your parenting style and getting on track with solid goals. stop putting out all the fires, time to catch the behavior arsonist! learning how to build and implement a solid routine and agreements. mistakes are going to happen, how will you learn and grow from them? time to get everyone on the same page, building agency. uncover what exactly triggers stress and how to use that to your benefit. where to go now? how to keep marinating and coming back to this work! "If you agree with positive parenting, JOIN this course- it's made for you. If you don't know about positive parenting, google why it works and THEN join this course!"